Along with Rosmersholm, the four plays collected here are the ones I'd most recommend to that lucky soul about to discover Ibsen for the first time. No especial interest in theatre needed: these read like gripping novellas, each a study of what happens when everyday hypocrisy, vanity & cruelty tear the social fabric to reveal the wild & dangerous truths beneath. 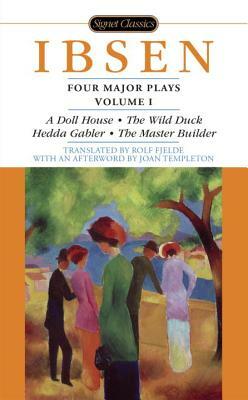 Among the greatest and best known of Ibsen’s works, these four plays brilliantly exemplify his landmark contributions to the theater: his realistic dialogue, probing of social problems, and depiction of characters’ inner lives as well as their actions. Rich in symbolism and often autobiographical, each of these dramas deals convincingly and provocatively with such universal themes as greed, fear, and sexual hostility, and confronts the eternal conflict between reality and illusion. These Rolf Fjelde translations have been widely acclaimed as the definitive versions of the major works of the father of modern theater. Henrik Ibsen (1828–1906) is one of the greatest dramatists of world literature. His verse dramas Brand (1865) and Peer Gynt (1867) brought him fame in Scandinavia, but he became known throughout the world with twelve prose plays in which he invented what is known as theatrical realism: Pillars of Society (1877), A Doll House (1879), Ghosts (1881), An Enemy of the People (1882), The Wild Duck (1884), Rosmersholm (1886), The Lady from the Sea (1888), Hedda Gabler (1890), The Master Builder (1892), Little Eyolf (1894), John Gabriel Borkman (1896), and When We Dead Awaken (1899). Ibsen made ordinary people, talking about contemporary things in everyday language, proper subjects for the stage, and in so doing earned the title “the father of modern drama.” Ibsen is the second-most widely produced dramatist in the world after Shakespeare.